Nor the gliding step of angels. That would not be his style. Wrapped in a mantle of light. Slinking his way to the crown. Of a strange fruit of memory. By single stroke of a needle. Into walkers of the talk. Shaka Sankofa was the Swahili name chosen by Gary Graham, the 36 year old African American man who was executed on December 22 2000, in the state of Texas, after spending 19 years on death row. The name Shaka refers to the famous warrior Shaka Zulu and Sankofa means “go back to past and bring to the present”. His execution order was signed by George W. Bush, then Governor of Texas, one month prior to becoming president of the USA. Shaka, maintained his innocence to the very end and fiercely resisted being taken into the execution chamber. He had been active for nearly two decade in the movements opposing the death penalty an to secure better opportunities for black youth. Quando un uomo non se ne va docile …. Disseminato per voce, penna, o etere? Ma alle parole seguiranno azioni. 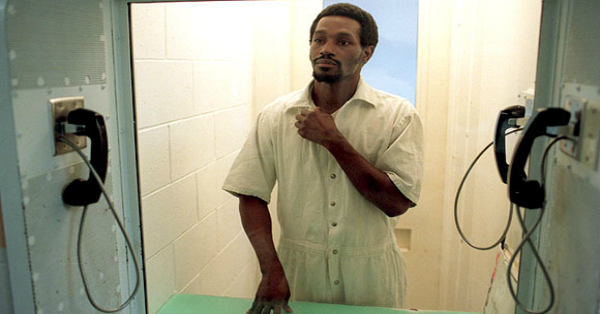 Shaka Sankofa è il nome in lingua Swahili scelto da Gary Graham, trentaseienne Afro-americano detenuto per 19 anni nel braccio della morte e giustiziato il 22 dicembre, 2000 nello stato del Texas. Il nome Shaka fa riferimento al valoroso re Zulu e Sankofa significa “ritorna al passato e lo porta al presente”. L’ordine di giustiziazione fu firmato da George W. Bush, ancora governatore del Texas, un mese prima di essere insediato come Presidente degli USA. Shaka continuò ad affermare la propria innocenza fino alla fine e resistette fieramente ai tentativi di condurlo alla camera della morte e di iniettarlo. Aveva partecipato attivamente per quasi vent’anni ai movimenti in opposizione alla pena capitale e per assicurare condizioni di vita ed opportunità migliori per i giovani afro-americani.